We have to thank our three speakers, Dr Louise Murray, Dr Sue Bowler and Dr Mike Ries for a really interesting, educational and entertaining evening at June’s Science Café on Thursday 14th. Here’s a little look back at the event. Clockwise from the top left, Dr Sue Bowler introducing the gravitational waves Nobel prize winners; Dr Louise Murray answering questions on Stereotactic Ablative Body Radiotherapy; Sue’s question time being managed by Marty Jopson and Dr Mike Ries about to demonstrate the remarkable properties soft body physics properties of cornflower in water (without mess!). Our next event will be the Science Cafe on the evening of June 14th. The topics will cover Stereotactic Ablative Body Radiotherapy, Gravitational Waves and Bringing Soft Matter Physics to Life. 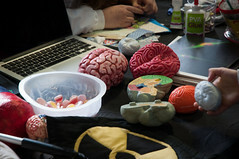 You can find more details on the Science Cafe page. In the meantime here’s a small look back at some of the interesting supporting materials our speakers at the March Café brought with them. 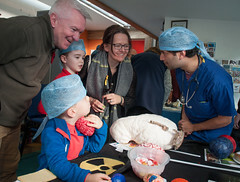 Our 10th Science Festival came to its end on Saturday 11th November with a very lively and popular Science Fair during the day and an enjoyable “Evening With A Space Scientist”, Professor Monica Grady, to round things off in the evening. 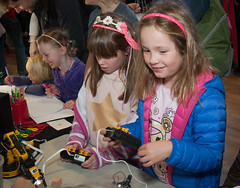 The Science Fair was enjoyed by its highest ever number of visitors, hopefully inspiring many future scientists. 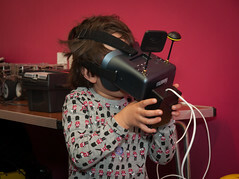 We have put a few photos of the event in an album here. 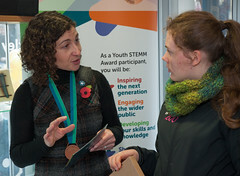 On the day we announced the winners of the Molecule Trail Molymod kit prizes. 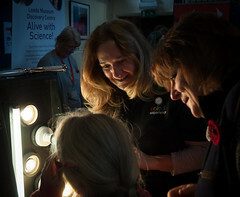 Angela Halliday and Sue Stanwell were there to be presented with their kits by Marty Jopson, pictured below. The third winner was Stanley Morton who was united with his prize later. 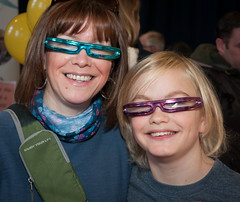 In addition to the Molecule Trail the Cairns family were winners of the Element Raffle. 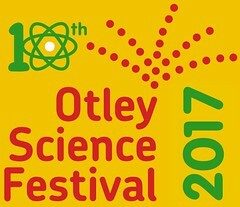 We would like to thank all the presenters, exhibitors, sponsors, volunteers and most of all the visitors who made the 2107 Otley Science Festival such a great success. 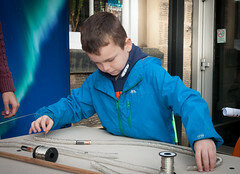 Today’s the day the Science Fair takes place, from 10am to 4pm, free for you to come and join in. Cakes, teas, coffees and lunch are available in the café all day. Happy 10th Birthday to us ! We thought we should properly celebrate our 10th birthday so the audience at last night’s (40th!) Science Cafe had a special treat, a slice of our specially baked birthday cake. A very tasty addition to the usual enjoyable science menu. The Festival continues with the film Hidden Figures tonight (Thursday); Technology Futures with Rashik Parmar MBE at Friday’s Science Lunch; Marty Jopson presenting Dangerous Equations on Friday evening and An Evening With A Space Scientist, Monica Grady, on Saturday evening. 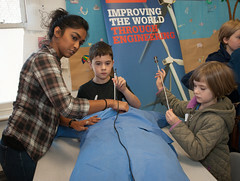 Plus, of course, the free Science Fair between 10 and 4 on Saturday.